Exercise is an important part of a dog’s lifestyle. If you’re like most pet parents, you don’t live on a hundred-acre farm or a cabin high in the mountains where your dog can run free. Your environment requires you to walk your dog on a leash, which is an enriching experience for you and your dog but, sometimes, it can also be a struggle. Daily jaunts should be a time for you and your dog to relax, catch some fresh air, and strengthen your bond. Often times, however, our intentions misalign with those of our canine companions and we find ourselves getting more of a workout that we bargained for — fighting for control of the leash. To most dogs, pulling is instinctive. Even small dogs can demonstrate ferocious strength when excited. The outdoors are full of exciting things to chase after and the sounds and smells are always changing. Dogs are eager to follow their nose (wherever it’s leading them) as fast as possible and they want to take you along for the ride. Correcting unwanted behavior requires training but, with the right tools, you can attain results with less time and effort. We’ve all seen it — that perfect dog/owner duo walking in tandem with plenty of slack in the leash. Unless you’re extremely lucky, synchronization like this doesn’t happen overnight. Training dogs is all about communication, memorization, and reinforcement. When the goal is to mitigate pulling, a dog needs to understand the chain of authority and learn that it will never get to where it wants to go by force, but rather for taking strides that are on-pace and parallel with the person walking them. This is why body language is key factor for training. Most dogs understand a handful of words but not enough to have a sit-down conversation about their misbehavior. To dogs, human vocabulary is nothing more than sounds — sounds that, through repetition, can be retained and associated with actions or consequences. As soon they make a step in the wrong direction, stop walking. A stern “NO” will let them know that they’ve made a wrong move. Training products are another important consideration that work wonders for most dogs. There are many harm-free solutions to help deter unwanted behavior, such as a limited-slip martingale collar. 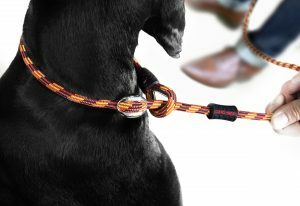 Several leashes feature built-in functions for correction, like EzyDog’s Luca Leash, which can be adjusted to the dog as a; non-slip training lead, limited-slip checking lead, or even a halter. Whatever method you decide to pursue, repetition is key to making your dog habitually avoid making the same mistake. 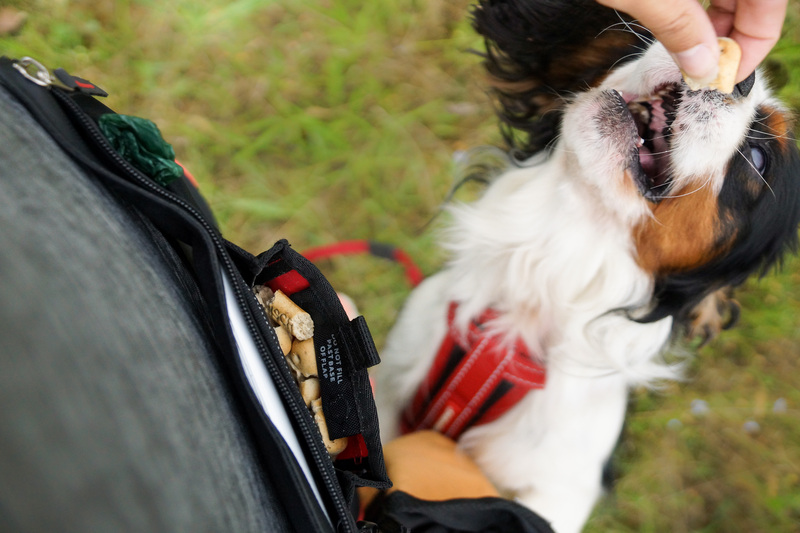 Keeping treats handy is a perfect way to reward a dog for good behavior. While there are many training methods available, almost all trainers agree on positive reinforcement to reward your dog for good behavior. For some dogs, a “good boy” or a scratch behind the ear is enough but, for most dogs, treats are key. Dogs have short attention spans and having quick access to a biscuit or kibble is important. EzyDog’s SnakPaks feature a convenient magnetic closure and spill-free design to make sure you don’t miss these imperative opportunities. If your dog isn’t catching on or is simply too old to learn new tricks, it may be time to consider easing the stress of their behavior as opposed to eliminating it. A properly fitted chest plate harness can work wonders for both you and your dog’s walking experience, giving you more control and padding that protects your dog. 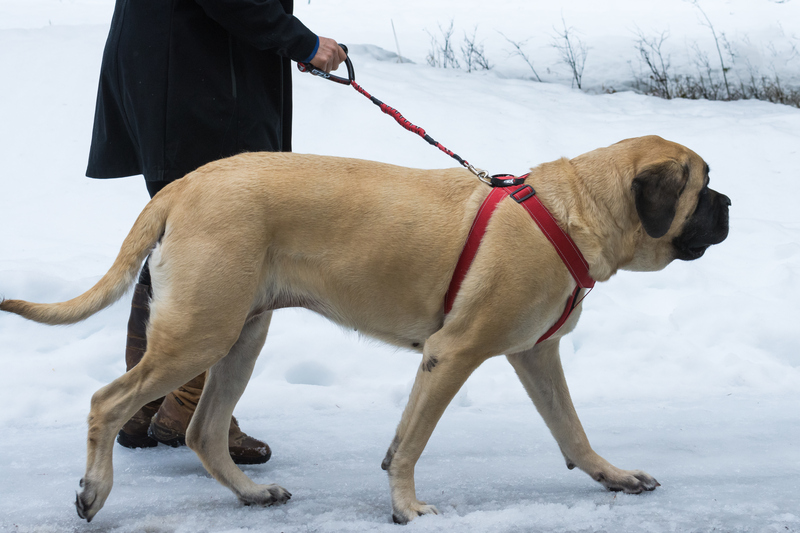 EzyDog Chest Plate Harness and Cujo Leash controlling an English Mastiff. Another thing to consider is pairing the control of a harness with a shock absorbing dog leash. Proper shock absorption will protect you and your dog from sudden movements. Not all shock absorbing leashes are created equal. Ideally, you’ll want one that has short and tight retention to break the static jolt exerted by your dog, like EzyDog’s Cujo Leash which also features a water-ski handle for even more control. If you prefer a more traditional leash with the same shock absorbing philosophy as the Cujo, try a Zero Shock Leash. This leash is made from a sturdy soft nylon and features a padded neoprene handle. 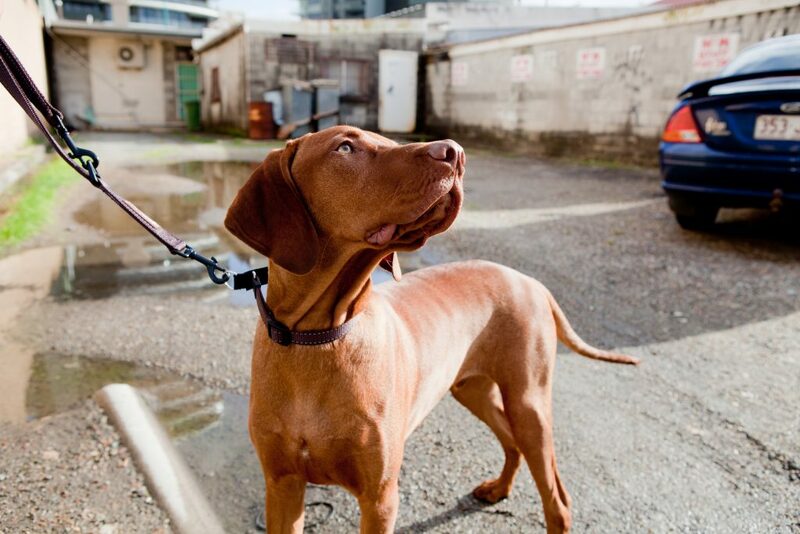 A traffic control handle at the dog-end of the leash gives you the option to bypass the shock absorption to keep your dog close. The Zero Shock is also available in a “LITE” version for dogs under 26lbs. 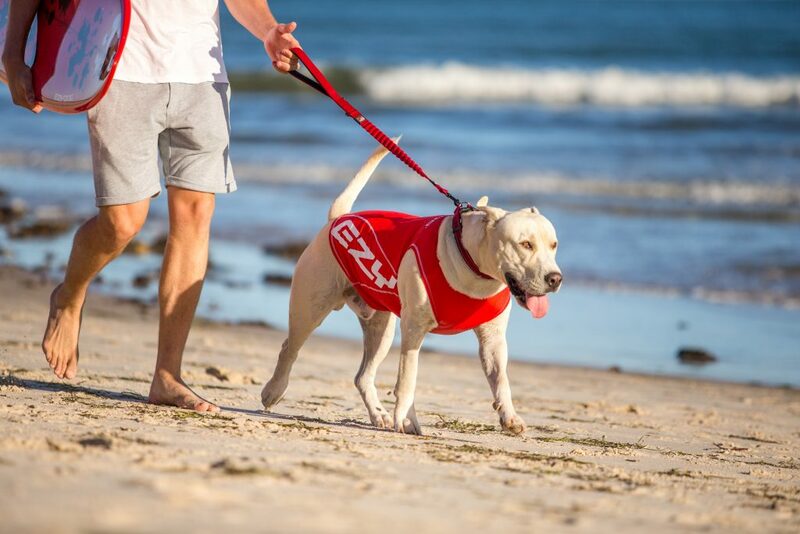 A stroll on the beach with the Zero Shock Leash.